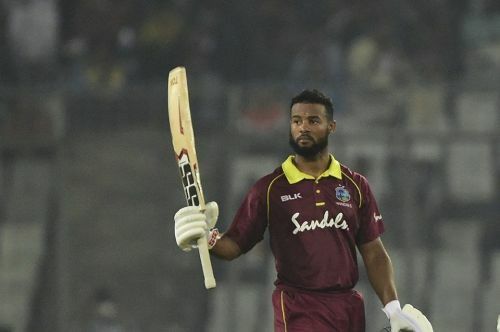 Thanks to Shai Hope 146 not out, West Indies defeated Bangladesh by 4 wickets in 2nd ODI to level the series played at Sher-e-Bangla Stadium, Mirpur on Tuesday. After winning the toss, the West Indies bowlers restricted Bangladesh to a modest total and Hope superb knock helped the visitors comeback in the series. West Indies captain Rovman Powell won the toss and decided to field first. Liton Das was forced to retire hurt due to an injury as he was hit on the hand. Imrul Kayes was dismissed cheaply for 0 by Oshane Thomas. The experienced pair of Tamim Iqbal and Mushfiqur Rahim steadied the innings scoring 47 for 1 at end of 10 overs. After the power-play overs, both batsmen took on West Indies bowlers. Rahim reached his half-century off 62 balls while Tamim Iqbal completed his 50 off 61 balls. Tamim Iqbal was dismissed for well made 50. Tamim Iqbal and Rahim added 111 runs for the second wicket and soo after then Rahim fell for 62 runs. Captain Shakib Al Hasan and Mahmudullah steadied the innings with 61 runs stand for the 4th wicket. West Indies captain Powell dismissed Mahmudullah for 30. Soumya Sarkar was dismissed cheaply for 6. Captain Shakib Al Hasan led from the front, reaching his half-century off 54 balls. Liton Das, who had retired, came out to the crease, but could only score 6 runs. West Indies bowlers restricted the run flow and picked wickets at regular intervals to restrict the hosts to 255 for 7 in 50 overs. For West Indies, Oshane Thomas took 3 for 54. Chasing the target of 256 runs to win, West Indies got off to the worst start, losing the early wicket of Chanderpaul Hemraj for 3 runs. Shai Hope and Darren Bravo steadied the ship scoring 37 runs in the first 10 overs. Both of them continued to put pressure on Bangladesh bowlers. Rubel Hossain picked the important wicket of Darren Bravo for 26, ending a 65 runs stand for the 2nd wicket. Hope reached his half-century off 67 balls. Marlon Samuels and Hope added 62 runs for the 3rd wicket before Mustafizur Rahman took the wicket of Marlon Samuels for 26. West Indies lost two more wickets of Hetymer and Captain Rovman Powell cheaply to be in trouble at 157 for 5. Shai Hope continued to showcase his batting talent, taking singles and hitting bad balls away for boundaries. Roston Chase could only contribute 9 runs. Hope provided West Indies hope to reach his 3rd ODI century off 118 balls. Keemo Paul struggled to time the ball but gave full support to Shai Hope. With 22 runs required off 12 balls, Hope hit 3 boundaries off Mustafizur Rahman over which eased the pressure on West Indies. Both Hope and Paul added 71 unbeaten runs for the 7th wicket. West Indies won the match by 4 wickets with winning runs by Keemo Paul who remained not out on 18. West Indies 256 for 6 in 49.4 overs (Shai Hope 146*, Mustafizur Rahman 2/63, Rubel Hossain 2/57, Mehedi Hasan Miraz 1/39) beat Bangladesh 255 for 7 in 50 overs ( Shakib AL Hasan 65, Rahim 62, Tamim Iqbal 50, Oshane Thomas 3/54, Roach 1/39, Bishoo 1/27) by 4 wickets. The third and deciding ODI will be played at Sylhet on 14th December. Opinion: Can Windies avenge their Test series defeat the upcoming ODI series?